Bring an element of Greek mythology to your office or classroom with Replogle's Atlas Desk Globe. 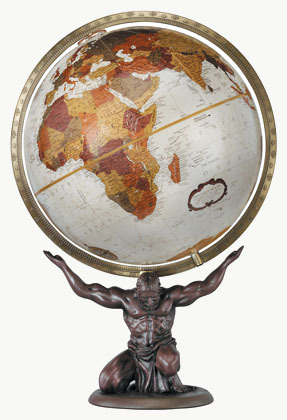 The classic bronze resin sculpture depicts Atlas holding the world on his strong shoulders. A full meridian features latitudinal markings and traditional details. Warm metallic-hued land masses complement the off-white oceans. The Atlas Desk Globe is backed by a one-year warranty.